I have always liked Gail Faith Edwards, and want to put that out there from the git-go. It’s rare, but every so often someone comes along who manages to retain and combine the wonder of childhood, the optimism of the teen years, the strength and humor of motherhood, and the wisdom of mature adulthood. This combination makes the very best story-teller, leaving us spellbound with their words. This is a description of Gail. 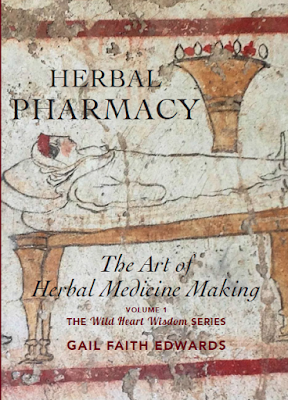 Long ago during various moves, I lost my copy of Opening Our Wild Hearts to the Healing Herbs. 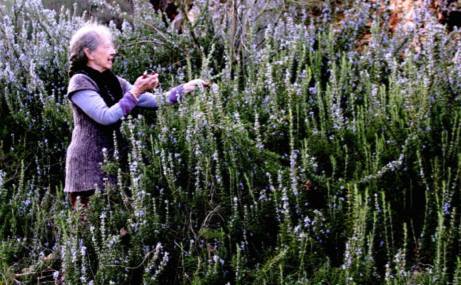 With that book, Gail started an herbal movement, waking up a whole segment of us to how we wanted to approach herbal knowledge and plants in general. 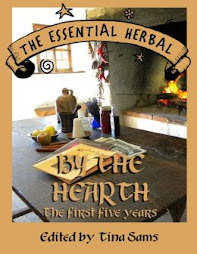 It had gone out of print, and although there have been a couple of other books from the author, her voice and gentle guidance need to be out there on the subjects covered in this book. This series is an improved revision of that book from the mid-90's. 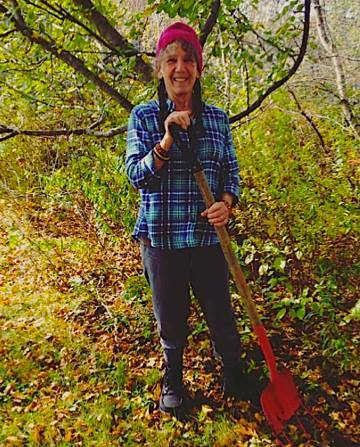 She teaches us how to find our allies and how to treat the plant world with reverence. Herbal Pharmacy is volume 1 in the Wild Heart Wisdom Series. In it, we learn how to make all of the herbal preparations we need to keep ourselves and loved ones healthy and happy, but we learn much more. When is the best time to harvest? What part of the plant? 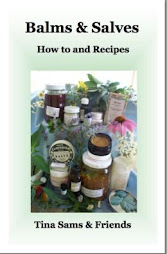 Baths, essences, balms, or spirit based medicine (I love that name!) are all included, and much, much more. 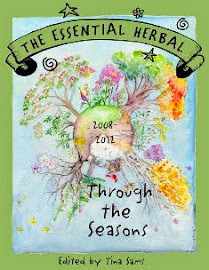 If you are beginning with herbs and looking for clear instruction on a variety of topics, this is your book. If you're intermediate and want to brush up on some things, you'd enjoy this book. 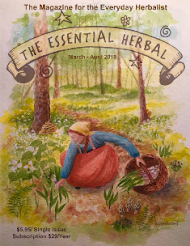 As an expert, you'd like it for the spiritual connection that Gail makes with the herbs. Go ahead, you won't regret it. The next volume will be the Materia medica. I’m looking forward to that, too. All photos in this post were brazenly stolen from Gail's facebook page. Misophonia is a real mental disorder that can cause discomfort, isolation, anger, rage, and even pain when hearing the sound of chewing, lip smacking, pen clicking, or other repetitive sounds caused by humans. For years I thought I was the only person in the world with this issue and would feel terrible when I would have to leave the room when a family member was eating carrots or plug my ears so I could watch a movie while someone typed on their keyboard. I thought I would have to deal with this forever by myself. Then one day my mother found a definition for it and I was as relieved as I am every time I find my favorite ear buds in my purse. 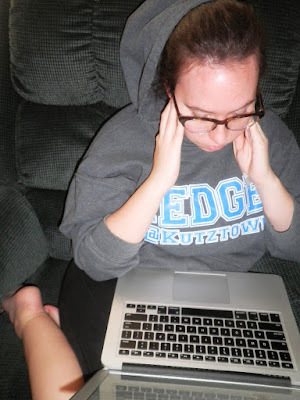 Unfortunately, little research has been done to help treat those living with misophonia but I found plenty of ways to cope. If you or your loved one has this disorder, herbs can be incredibly beneficial and may even halt a panic attack in its tracks. Aromatherapy works wonders when someone with misophonia is being triggered. My mother gave me a little black cat doll filled with lavender to take to school with me when I was little. Anytime the teacher cracked her gum or a fellow student had the sniffles I would reach for my lavender-scented friend and take deep, calming breaths. I cannot suggest this idea enough to parents that have children with misophonia. They will never want to leave home without it and it will help them learn to deal with their triggers in a healthy and manageable way. If you’re an adult and cannot bring a stuffed animal to a meeting or presentation, you still can have the benefits of aromatherapy right under your nose. In the winter I often wear a scarf. Before leaving home every day I will usually spritz my scarf with our lavender spritz or liquid smudge. If someone next to me in line is humming or tapping their feet I can discretely lift the scarf over my nose and inhale slowly. During the spring and summer I will often spritz the pages of my current notebook with similar scents. That way I can begin writing or doodling and inhale the fresh, calming scents without looking like I am huffing a book. I know between my mother and I it sounds like a broken record but I will always suggest taking holy basil. I often drink the tea but if I need a cup of coffee or I’m dying for some ginger tea I will put holy basil tincture in it as well. I swear this little plant has saved my life on many occasions. When I lived in New York I was surrounded by coughs, wheezing, and (my personal favorite) slurping. 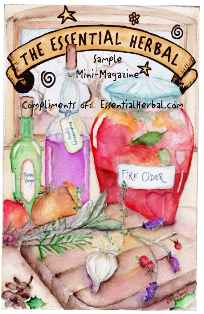 Every day before work I would have a cup of holy basil tea or tincture in my morning cuppa. Then I would bring the tincture with me to work and take it as needed. It helped me get through the day and was always a quick pick me up if I was getting too frazzled. If Tulsi is a little too herbie tasting you may enjoy lemon balm. It has a gentle citrus taste and has been used for years to combat SAD (seasonal affective disorder). Though it is mainly taken for SAD I will drink it hot or cold to help me calm down and readjust my focus away from the sound that is distracting me. It may seem counter-intuitive but I will also sip coffee a lot of the time I’m trying to manage my symptoms. Unlike the herbs mentioned above this plant is loaded with caffeine (as you already know). While it is good to calm down and get out of your head when you are dealing with symptoms, you do not want to lose energy or momentum. Having a cup of coffee will allow you to escape the noise and stay focused on the task at hand. While researching for this article I learned one way people with misophonia manage symptoms is through physical pressure. By using pressure on their forehead, chest, or other parts of their body they are able to calm down and get through their day. Parents with children of misophonia have even created pressure blankets filled with sand or small pebbles to help their child feel grounded and calm. I found this absolutely fascinating and wondered how to incorporate it with herbs. While I have yet to create a blanket I have begun to use rice packs filled with lemon verbena and lavender to place on my forehead or temples. I have also begun using warm tea poultices on my eyes to create a comforting meditation. I have found it works really well for me and does create a sort of grounding feeling when your mind is flying every which way to try to stop the noise. Some people call it going for a walk but I enjoy running around town looking at everyone’s front gardens. It is calming, gets me out of my head, and you may find a new plant you absolutely need. During many walks around town I see beautiful natives and new interesting plants that I take pictures of or look up while I’m walking. It is a great learning opportunity and I end my walk calm and fulfilled. To those reading this because they have misophonia, it’ll be ok. To those who love someone with misophonia, thank you so much for your undying patience and love. And for those learning about this for the first time, thank you for taking the time to understand. So while we were in Wisconsin I stumbled into some vanilla beans and few days ago Mom handed me a bit of turmeric. So what should I do with my surprise bounty? Throw it in alcohol of course! With the turmeric I put in a little black pepper to heat things up. Ken is pretty active and usually has sore joints after a basketball game or a run downtown. I’m hoping that with a few doses over time he will be feeling right as rain. I, on the other hand, made something pretty indulgent. I adore vanilla extract in my iced coffee in the morning. I use it in baking as well but on a daily basis there is usually a splash in morning Joe. It helps sweeten the coffee without adding extra calories to your morning brew. Just be sure not to add too much! Let me know what creations you guys have going on! I can always use more inspiration.